Exploring next-generation sequence data requires an iterative process whereby a researcher can find a "needle in the haystack" that contributes to a particular disease or other phenotype. Once that needle has been found, a workflow can be established for analyzing other samples or to create a repeatable, time-effective process for clinical usage. Yet, repeating a workflow that involves several different quality control, filtering, and analysis steps is burdensome and error-prone. 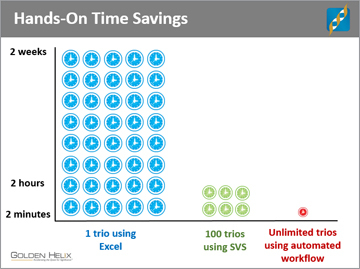 To solve this problem, we introduce custom workflow automation in SVS, which allows you to collapse dozens of steps into a few run-specific options. This click-and-go process saves an exponential amount of time while eliminating the inevitable user error that happens with tedious repetition and ensures that the exact same protocol is followed with each run, a critical requirement for use in the clinic. Autumn Laughbaum joined Golden Helix as an intern June 2010 and came aboard shortly thereafter as a Product Quality Specialist. In 2012, she moved to the Analytic Services Department as a Biostatistician. Autumn earned her Bachelor's degree in Mathematics and Statistics at Montana State University in December 2010. When not working, Autumn enjoys time spent outside hiking or running as well as quality time at home cooking with her husband and dog.